Google launched the Google Manufacturer Center in 2015 to enable manufacturers to provide Google with product data. Google claims there are three incentives for manufacturers to consider doing this. Google Manufacturer Center is not the same as Google Merchant Center. Google Merchant Center is where your retailers (and you if you sell direct and advertise) upload product data with the purpose of enabling advertising using through Google AdWords. But there is substantial overlap in the data that is provided to both Google Manufacturer Center and Google Merchant Center. Google mentions the benefits to manufacturers of this tool in the thinly detailed description offered here https://adwords.googleblog.com/2015/07/introducing-manufacturer-center-tool-to.html. They have produced a more substantial 30-slide PDF that we’re happy to share on request, but even this enhanced detail remains significantly insufficient to gain a full view of the pros and cons. What Google doesn’t explicitly tell us is what else happens once manufacturers provide additional product data. Here’s an example of a manufacturer who has not uploaded product data to Google manufacturer Center. All product data that is enabling these shopping ads is coming from the advertising retailers that uploaded product data through Google Merchant Center, which in this case happens to be the direct-selling manufacturer. Now let’s look at a product where a manufacturer has uploaded product data to Google Manufacturer Center. These grouped listings above started to show up about the same time as the launch of Google Manufacturer Center in 2015. In mid-2016, Google required all shopping feeds to include GTINs where they exist for products being sold. It is our belief that this requirement enabled Google to more easily tie products being submitted by retailers to the “rich product information” provided by manufacturers through Google Manufacturer Center. This made this grouping of sellers by price possible. When this grouping occurred, sellers lost a great deal of control over how product listings are presented. Notice the differences between how product listing ads are presented in the first and second images above. Manufacturer center shifts focus to the product and customer experience. It’s relatively retailer agnostic with price being the main differentiator between retailers. Sellers lose their ability to differentiate – their ability to display possible product variations, for size or color for example are reduced. This may be a draw for many manufacturers who desire a higher level of brand control over their product images. However, there is no guarantee that Google will use your furnished image(s). 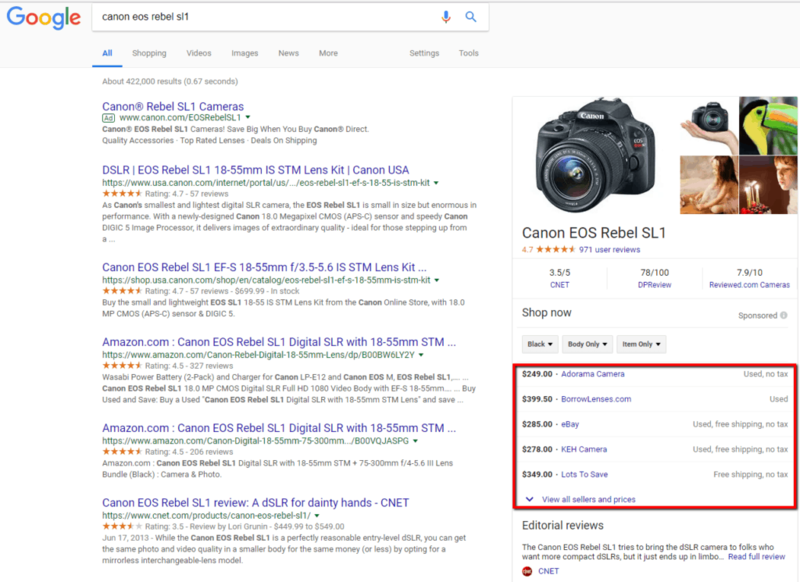 Instead of product reviews coming from a review source the advertiser uses on their site, Google automatically pulls in user reviews from multiple review sites such as eBay, adorama, and eBuyer. That’s nice for the consumer because there are more reviews. But notice how Google also pulled in reviews from CNET, and a couple other review sites. The manufacturer cannot stop this or change the source. In this case, consumer reviews offered a strong 4.7 stars, the equivalent of a 94% (an A- in my schooldays). But the CNET review that is pulled in displays a 70%, a school grade equivalent of a D+! What a massive disconnect, and I really can’t think of a worse thing to be presented to consumers at the time they are thinking about a purchase. These reviews are written by an individual at CNET, and can and often do disagree with consumer sentiment. These reviews are subject to biases from the individual and in this CNET example that certainly did not agree with the consensus of the other 971 people who reviewed the product. An additional review feature added is the editorial reviews that show beneath the grouped seller listings. Note how CNET strikes again with review language that isn’t particularly positive. Once this information is pulled in, there is nothing the manufacturer can do about it. That’s a lot of risk to manufacturers who could be affected. By grouping listings, Google sharply reduces differentiation associated with listings. This causes pricing to go from one of several purchasing decision factors, to becoming the primary selection criteria, and primary focus. This can create multiple negative consequences. Many brands don’t want the primary thought process in a prospect’s mind to be a focus on price. An online retailer or direct-selling manufacturer wants to do their selling on the website, not on Google’s search page. That way they have an opportunity to build a brand connection. Bad for retailers – goods are more likely to trade for the minimum available price. And price becomes the primary decision factor in where consumers choose to buy. If you don’t have MAP pricing, this could cause a price war amongst sellers – the race to the bottom. If you do have MAP pricing, it could increase the necessity to police these policies more directly. It is apparent from seeing how Google has combined manufacturers products with review data, that surrendering control to Google can oppose the best interest of manufacturers and retailers. What’s coming in the near future is an enhanced version of Google Express. In this version, Google will allow consumers to make their purchase right from Google Shopping via an add to cart button on the search results page. Read that again if it didn’t raise your eyebrow. This will eliminate the need to visit a brand’s website at all. Everything is a transaction controlled by Google, where the seller of the product does not interact with the customer. The ability to establish a connection with the brand and develop long-term value in a customer relationship is stripped away. Time will tell how this will play out, but as you can see, it sounds a lot more like Amazon’s model, which has generally not been good to much of the retail industry. One of the advantages sellers have had with Google (unlike Amazon) is the ability to drive prospects to their website and establish a brand connection with them. There is benefit to both parties. Will Google move away from this? Google mentions that manufacturers will “learn how many times their products appear on Google within a given timeframe and how many times shoppers click on their products versus competing products in their category.” But how actionable is this information? What could manufacturers actually change as a result of having this information? The category comparison appears to be compared to a large, broadly defined category, and thus loses meaning. These are not actionable metrics at right because nobody knows how the Category Impressions were calculated! How big is the category? Narrow? Wide? 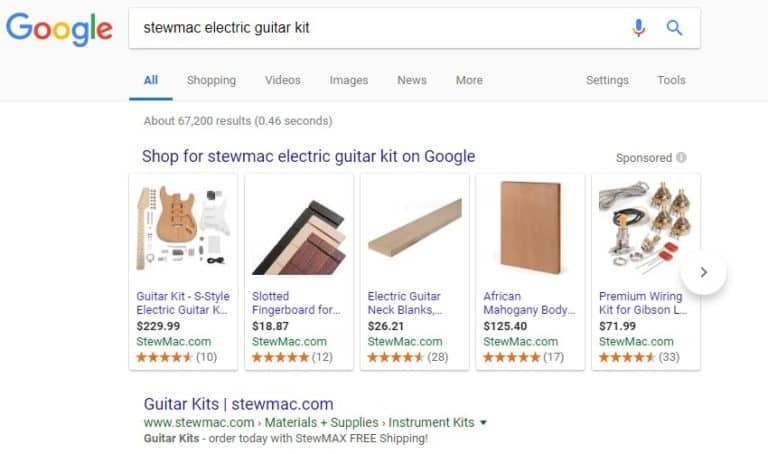 In the case where a manufacturer sells direct and runs their own Google Shopping ads, they will already have much of this data available from their AdWords account. These manufacturer center reports are issued in a CSV file on a rolling 12 weeks basis by individual sku. So they’ll take some work to get into a user-friendly state. One feature that we believe would be valuable for some manufacturers is the ability to see click and impression data across all advertisers of the manufacturers products (combined). This can be a benefit to manufacturers, especially if retailers have been uploading lower quality data. Enriching Google’s inventory of product information with supplemental product images, detailed descriptions, and eventually additional languages could be beneficial. But we’d recommend reviewing the data that is already being submitted to see if significant deficiencies actually exist. Typically, retailer provided data is actually pretty good. In some cases, it already matches manufacturer data. The only way that product sales are likely going to significantly increase for the manufacturer is through more clicks. Look at those two images again – which do you think gets more clicks? The first one where there are multiple images across the prominent real estate, or the second one where there is one primary product image followed by a listing of sellers with an emphasis on price? In our experience across dozens of retailers and direct-selling manufacturers, when listings changed from individual listings to the grouped listings, click and sales volume declined, often sharply. Of course, we’re pretty good at running Google Shopping ads for our clients, so they had very good search results prior to Google taking them away and replacing them with the grouped listings that emphasized price and little control over review content. Clients lost a lot of real estate when this change occurred. An advertiser who isn’t very good at running Google Shopping may not lose any listings from the search results page, so they may not suffer the same decline because they didn’t have much benefit to lose. But the idea that sellers would get more clicks and sales? We only buy that if they are consistently the lowest-priced seller, because price is the focus of grouped listings. Here’s an example of one of our manufacturer client’s listings on the search results page. This drives a lot of sales volume. Consider what will happen if Tumi enlists in the Google Manufacturer Center. We expect that Google may select one backpack model to group listings under by seller. Tumi will lose its ability to capture the bulk of traffic and sales to retailers. Color and model options will no longer be presented on the page. Expect reviews that Tumi has no control over to be brought into the listing. As an aspirational brand, it ‘s important for Tumi to capture people searching for its products and get them to their website. The ability to add customers to their own list builds long-term value and enables Tumi to continue the conversation. Adding customers to anyone else’s list does not enable this capability. Additionally, if the future state of Google Express results in people buying right from Google and not clicking to a website, this will negatively impact Tumi’s customer experience and opportunity to build long-term customer value. At right is a grouped listing that is pulling in extraneous information. In this case, Google only listed one seller, eBay, and then included a small link to “View all sellers and prices”. Again, we have review commentary such as “not top of the line” being pulled in, which we suspect Asus doesn’t appreciate. How could this result in an increase in clicks? The links to the sellers are barely detectable on the page. Compare that to the example below. It seems fairly obvious that the ungrouped listings are likely to drive a great deal more click and sales volume. If a manufacturer were sure that their reviews from all third-party sources that Google may pull from are positive, then this emphasis on reviews could be positive. But there would still be a likely loss in sales volume in our opinion due to how the real estate changes. However, if the manufacturer sells through mostly brick and mortar, and online isn’t that important, then it may indeed be valuable to introduce this additional product information to the search results page. Like many complex things, there are costs and benefits involved in the decision to upload product information to Google Manufacturer Center. It is clear that manufacturers who submit product data to Google are choosing to provide Google with more control. 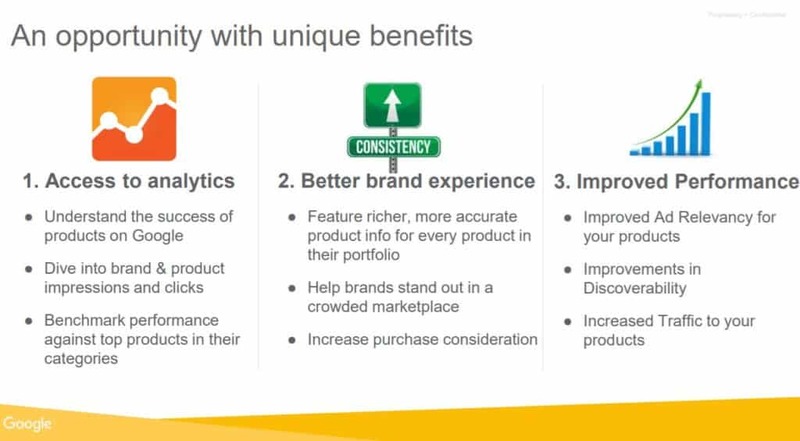 Each manufacturer will need to decide what’s best for them, and their view should be influenced by long-term goals, but will likely differ depending upon whether or not they sell (and advertise) direct, and whether or not other retailers also sell their products. What we know is that once product data is uploaded to Google Manufacturer Center, there is no going back. There could be a big benefit where some of the risks aren’t present for manufacturers that are not trying to build their own ecommerce. Some brands focus purely on supporting their retailers and building the customer experience. Have a lot of collateral surrounding their products such as positive third-party reviews. Convert customers mainly via brick and mortar, letting their online retailers pick up the online demand for their products. Have products that are usually part of a bigger basket. Items that are expensive to ship relative to product cost sometimes do better at ecommerce retailers since they can become part of a bigger basket. Are retailer agnostic – don’t care who sells so long as the sale happens. Conversion path specializes in digital advertising for direct-selling manufacturers and specialty retailers. One unique capability we have is the ability to help our clients with search page dominance in a way that is profitable. See the example at right for a powerful illustration. We work for our clients, not Google or Facebook or any other ad platform. While we love how ad platforms enable our clients to acquire customers and grow, we do not support when the ad platforms work in opposition to our clients’ interests. There is a present theme of ad platforms taking more control in order to offer more simplification. This may be okay for smaller advertisers that lack management resources to optimize ads, but it lacks the sophistication that brands need to yield a strong ROI at scale. We resist broadly-applied changes in control that hurt sophisticated advertisers like those we work with. When organizations take control, they rarely give it back, and how they use that control can change. Google Manufacturer Center may have been devised with the noblest intent, but for certain manufacturers, there simply are costs that outweigh the benefits. We view it as our role to educate clients on decisions such as this in order to protect their own interests.